Archaeology and Architecture are often united in the material and spaces they occupy but opposed in the methods by which they communicate. 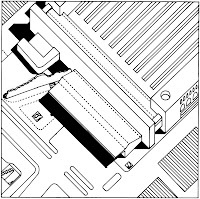 In Architecture knowledge is imparted by construction, by the accumulation of elements built up to define space. But Archaeology, at least the historically most recent manifestation, tells its stories by subtraction, by the removal of layers of subsequent history to reveal a distinct originary structure that represents a type of authenticity. The Forum Romanum, the great model for subsequent urban spaces and itself the source of much archaeological material, was witness to two forms of historical layering. The sedimentation of periods of inhabitation over the graves that form the initial stratum is one aspect that tied the space to its sense of place. Another aspect is how that place witnessed forms of reconstructed archaeology in the periodic restoration of temples, most notably that of Jupiter Optimus Maximus which dominated the view across the forum from the Capitoline hill. Spaces in colonial settlements, such as the present Piazza del Foro, Brescia referred to this model of eternity across the distances of space, providing a strong conceptual image of Rome outside Rome itself. The past was a vivid entity that gave meaning to the present rather than a forgotten context that framed the immediate world in a casually unacknowledged way. The past, in the form of the trophies of earlier or conquered civilisations, was a phenomenon that Rome appropriated to define its own identity. The most spectacular examples of this activity were the obelisks that would be repeatedly exploited to express power in the public realm over subsequent centuries. These great fragments of Egyptian culture ornamented imperial sites such as the Horologium Augusti and were placed to be seen in relation to new creations such as the Mausoleum of Augustus and the Ara Pacis. As well as the compositional legacy left to subsequent urban design, the eclecticism this strategy represented would also exert an influence in providing the material for an archaeological identity expressed in the public realm. With the christianisation of the empire, and the collapse of its western structures which followed during the ensuing period, the explicit messages of time played a significant part in the creation of new urban spaces and forms. The existing buildings and infrastructure provided the quarries for the new complexes that interpreted eternity not as a material product of military and political triumph but as the focus of immaterial aspiration. The spoliation of temple and bath buildings to create the baptisteries, porticoes and basilicas of christian cities adopted an often subversive attitude to the past out of which they were built. Colonnades framed the arches of an anticipated triumphant return for Christ. 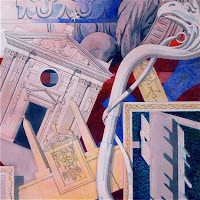 In this context the fragmentation of the past and its reconfiguration would express a uniquely creative continuity with the ancient world. Such activities were, of course, inimical to the scientific methods developed for archaeology in later centuries. Their purpose was to create a new world and not discard the past, an eminently contemporary attitude seen in the transhistorical appropriations of postmodernism. Beyond the interventions in Rome itself other settlements witnessed the reoccupation of existing public spaces and the establishment of new centres in previously marginal locations, as occurred in Brescia at Piazza del Duomo (currently Piazza Paolo VI). A complex of religious structures defined the new space as a sacred territory, a situation replicated in other cities with the addition of palaces representing the temporal power of the bishop. At Torcello, the abandonment of existing centres took an extreme form in the relocation of a entire community from an endangered mainland to the relative safety of a lagoon island. The remains that survive there, the basilica, campanile and polygonal church present the principal elements of the medieval Italian city, but due to its own eventual abandonment they stand free from the accretions that characterise their counterparts on the mainland where inhabitation had been more continuous. The medieval city states were keen to exploit the iconography of antiquity to support their claims to power, and archaeological remains played the part both of mnemonic devices of the city’s history and indicators of future ambition. The imitation of ancient sculptural forms, particularly those derived from sarcophagi, to fulfil programmes of new public sculpture such as the fountains of Perugia and Siena, served to reinforce many aspects of civic identity prior to the broader rediscovery of ancient culture that characterised the developments of the fifteenth century. The interpretation of the antique past as evidenced through its cultural remains, above all its archaeological survivals, influenced the design of urban space in the renaissance in architectural language, in its political use of iconography and in its creation of new cultural forms. The modern discipline of archaeology has its origins in this period, when it was seen as entirely consistent with architecture and antiquarianism. The support for dynastic claims to authority was provided by the revival of the motifs of the forum and the capitol, for the Sforza at Vigevano and for the Gonzaga at Sabbioneta but also in the urban planning of Venice and Rome itself. The appropriation by Serlio of the Latin line Roma quanta fuit ipsa ruina docet (Her very ruins tell how great Rome was) for a specifically architectural purpose is just one example of the duality of this phenomenon, both looking back to the vanished past and offering ruins to the future, as a means of space capturing time. Piazza della Loggia in Brescia incorporated spolia in new structures, inscriptions and garlanded bucrania to evoke an antique dignity to the new mercantile centre of a city recently subject to the territorial expansion of the Venetian republic. At Vigevano a wholesale attempt to recreate a forum in the birthplace a Sforza duke has been identified as an archaeological device to erase the signs of communal independence. The recreation of Piazza San Marco in Venice amplified that revival of Roman iconography in expressing the republic’s imperial ambitions, while in Rome itself the radical reordering of the Capitoline hill employed excavated sculptural figures from across the ancient city to frame the new urban paradigm. Michelangelo’s work itself provided the model for the sort of theatrical space created at Sabbioneta, this very small new Rome even being centred on an umbilical column which was itself archaeological booty transported north to the Po valley after the Sack of Rome. A transhistorical continuity of urban form was therefore established which only reached a terminal crisis during the changes to cities which occurred during the Enlightenment and subsequent industrialisation. The archaeological discoveries of the eighteenth century had a significant effect on the aesthetic character of public space in Italy through the conscious application of forms derived from the excavations at Paestum, Herculaneum and Pompeii. The attempts to uncover an authenticity in the past can be contrasted with the inventive compositions of Giovanni Battista Piranesi, where the combination of motifs combined the iconographic traditions of the baroque with a vigorous formal ingenuity. This phenomenon was disseminated through the wide distribution of his images, but was demonstrated in Rome itself by the spaces he created on the Aventine hill for the Knights of St. John of Jerusalem. In Piazza Cavalieri di Malta, Piranesi took the antique forms of the obelisk and stele but adapted them to bear the militaria and other insignia of the crusading order, and reference both its history and that of the armilustrium, the ancient ceremony which had closed the fighting season. The elegiac quality of this constructed capriccio used archaeology as the spur for the design of new urban forms. Throughout the nineteenth century this same impulse would reoccur, most especially in Rome. 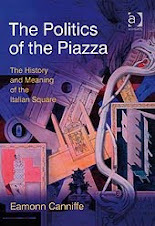 Giuseppe Valadier’s interventions at Palazzo del Popolo, Gaetano Koch’s planning of Piazza dell’ Esedra (now Piazza Repubblica) and Giuseppe Sacconi’s design of the Monument to Vittorio Emanuele II at Piazza Venezia amplified the political uses to which archaeology could be put to express the continuity and change of regime. Valadier’s work resulted in the casting of a picturesque landscape with ruins over the baroque theatrical space that had been created for Pope Alexander VII. The statuary, of Neptune and Mars and barbarian slaves, the rostral columns and the great triumphal fountain were intended to evoke the past rather than simulate it. In contrast, after the Risorgimento, Piazza dell’ Esedra created an implicit connection both in scale and gestural grandeur between Koch’s new hemicycle of buildings and the ruins of the Baths of Diocletian, christianised during the Renaissance into Michelangelo’s church of Santa Maria degli Angeli. Without the same authentic focus, however, Sacconi’s Vittoriano adopted the size and luxury of ancient temple complexes as the model for a modern monument. The familiar repertoire of iconographic statuary, more rostral columns and a bronze equestrian sculpture are framed against a series of ascending layers which adopt the language of the past to offer a projection of some imperial future. It is therefore a matter of some irony that Sacconi’s domineering work should be appropriated as the symbolic grave of Italy’s dead in two world wars. Archaeology continued to occur as a motif in the era dominated by the Modern Movement, either as an inspiration for the spare and undecorated forms favoured by the new architectural language or as a means of heightening the contrast between the ancient past and present. In either case the archaeological presence evoked a form of authenticity to place or history that continued to be loaded with political significance. The appropriation of the meaning of the past for contemporary support was most explicit under fascism but contained within it a corrosive ambivalence. 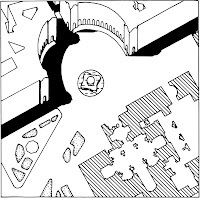 The ‘liberation’of Roman remains from their medieval, renaissance and baroque accretions ensured the destruction of the past as well as its revelation, the dubious quality of subtraction leaving ambiguous wounds, for example, in previously consistent urban fabric around the Mausoleum of Augustus in Rome. In Brescia a similar impetus would lead to the partial reconstruction of the capitolium of the Roman forum at the same time that an entirely new public space was under construction in the city at the behest of the regime. Marcello Piacentini’s Piazza della Vittoria, inaugurated in 1932, took the model of the Forum Brixiae but effectively masked any genuine remains uncovered on the site for what were the most modern buildings built in the city to that date. Despite the fall of fascism, and perhaps in reaction to its political exploitation of archaeology, a work such as the piazza at Stazione Termini in Rome completed in 1950 would show due deference to the section of the Servian wall remaining on the site. 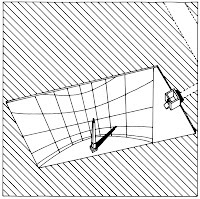 The confrontation between antiquity and modernity was simply presented without comment other than the echoing of the profile of the wall in the concrete vault of the new booking hall, an abstract gesture which sparked no controversy. However in more recent times archaeological heritage has again become a subject for the expression of violently opposed opinions. 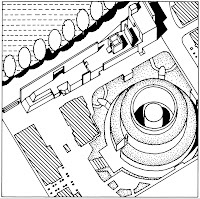 The disputes concerning Richard Meier’s Museo dell’ Ara Pacis adjacent to the Mausoleum of Augustus concerned themselves with the relationship of museum and mausoleum and largely ignored the inauthentic origins of the key determinant of the new building in maintaining the new position of the Ara Pacis established only in 1937. In the contested territory of the contemporary city the past, and a culture’s construction of its past, might be thought to depend as much on forgetting as on remembering.